Florence Gertrude McSweeney, 85, of Sherwood, born March 27, 1932, went to her heavenly rest on February 18, 2018. Mrs. McSweeney is preceded in death by her parents, Omar and Irene Gingras, of Holden, Massachusetts; and her brother, Richard Gingras and his wife, Barbara. 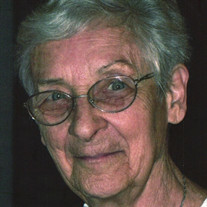 She is survived by her beloved spouse of 66 years, George J. McSweeney; children, Kathleen Carpenter, Michael McSweeney, Anne McSweeney-Crabb (LeAllen), and David Mc Sweeney (Sherri); grandchildren, Trysten, Trey, Greg, James, Allison, Matthew, and Michele; numerous great-grandchildren; and her brother, Edward Gingras and his wife, Beverly, of Shrewsbury, Massachussetts. She was a dedicated wife and mother to her family. She participated in Girl and Boy Scouts of America during the early years of her children's lives. She poured her life into the rearing of her children, not seeking employment outside the home until they were older. She loved gardening and flowers with a special passion for orchids and African violets. Along with her husband and children, they produced a large garden each year, the bounty of which she preserved and shared with others. Mrs. McSweeney was artistically gifted lady who applied her talent to sewing clothes and toys for herself and her family, to a ceramics business, to sewing and embroidery for gifts, and to the Arts and Crafts Guild for many years at Immaculate Conception Catholic Church. She was a member of the Immaculate Conception Church Alter Society and volunteered her services for a time in their business office. She enjoyed traveling with her husband within the US and abroad, and they are members of the Good Sam's Travel Club. She also enjoyed riding with her husband in the Goldwing Motor Cycle Club. Together they enjoyed attending antique car shows. She will be greatly missed by her husband, family, and friends. In lieu of flowers, the family requests donations are given in Mrs. McSweeney's name to the Alzheimer Research at Alz.org or St. Luke's Episcopal Church Respite Care Program at stlukeepiscopal.org. We will celebrate her life with a visitation (6:00-7:15 p.m.) and Rosary (7:15 p.m.) service on Thursday, February 22 at Smith-Sherwood Funeral Home, 7700 Hwy 107, with a Mass of Christian Burial, Friday 10:30 a.m. February 23, at Immaculate Conception Catholic Church, 7000 JFK Blvd, NLR. Burial at Arkansas State Veterans Cemetery. Please visit www.smithfamilycares.com for guest register . Immaculate Conception Catholic Church in North Little Rock, Arkansas.